About journal | Electronic supplement to the "Russian Juridical Journal"
Electronic supplement to "Russian Juridical Journal" (est. 2010) is scientific, theoretical, information and practical edition open to researchers of law and their extraordinary ideas. 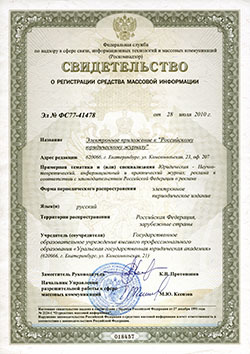 The founder is the Urals State Law University. It is issued 6 times a year. ISSN 2219-6838. 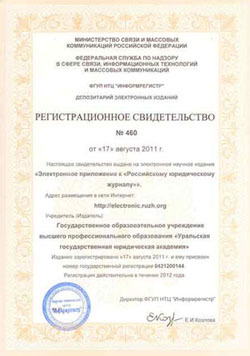 Certificate of state registration number EL 77-41478 (July 28, 2010) by Roscomnadzor. According to art.1 (p. 1 p. 2), art.11 (p. 4) of FL 29.12.2010 № 436-FZ the journal is not subjected to marking. The mission of the Electronic supplement to Russian Juridical Journal is to provide the researchers and interested audience with systematic practice-oriented, theoretical and methodological information for analysis and solution of the major legal problems. • attraction of the widest audience for a discussion on legal matters and for development of legal culture and legal consciousness. • international, peer-reviewed, scholarly, open access journal, which publishes original research articles, reviews, letters in all areas of national and International law. • important and reliable source of current information on developments in the legal field (see the Headings here).The journal serves as a forum for research and ideas by leading professors, judges, practitioners, and students of law. Creative Commons «Attribution – NonCommercial – NoDerivatives» 4.0 Worldwide.